Before taking on a new project, it’s important to get a sense of the type of capabilities that a dependable lightguide manufacturer should be able to offer. All companies aren’t created equally, particularly when a custom lighting solution is needed. So it’s essential to find the right match. 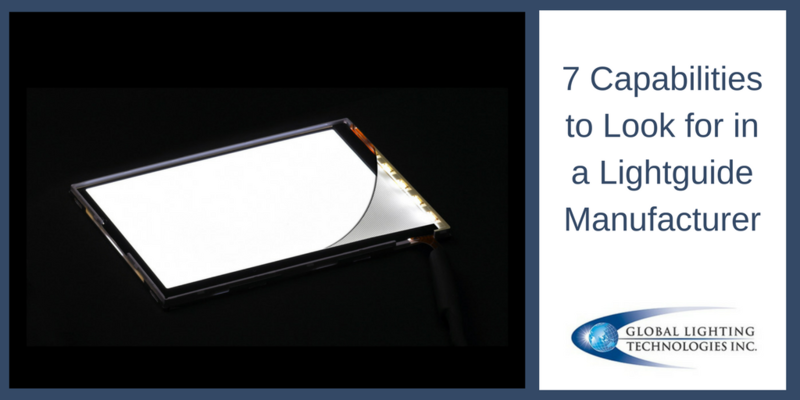 Let’s look at seven of the most important capabilities to look for. This means having the right technology and the right staff to handle precise, high-tech optical design. When considering a lightguide manufacturer, you should confirm they have at least one, if not more than one, type of ray tracing and design software. Also, consider how they’re able to extract light from a lightguide, including laser etch, chemical etch, and optical lens designs. A lightguide manufacturer should also have an in-house optical design engineer. Building further on this, there must be strong experience with all the different components used with optical systems. This includes the effect of assembly on the optics, and the overall ability to design effective and precise optical systems. Who controls the IP for the core technology being used in the system? If it’s not the lightguide manufacturer itself, there could be litigation issues down the road. A great optical design is one thing, but it won’t get the job done if materials aren’t properly molded. Look for expert manufacturing capabilities for optical plastics and molds with optical surface finishes, as well as clean facilities for assembly and injection. Inspection capabilities are also key for any lightguide manufacturer. They should have the proper equipment for inspection and measurement for high precision plastics, as well as camera and optical inspection systems. Optical components require special care during manufacturing and assembly. Look for a company with the appropriate experience and capabilities here, and once again, clean facilities. There’s no reason that all of the above has to be prohibitively priced. Look for a lightguide manufacturer who owns their own factories and completes all of the design work in house, which means there’s no need for more costly consulting or subcontracting. Global Lighting Technologies is a leading lightguide manufacturer. With almost 20 years of successful experience, more than 1.75 million square feet of manufacturing space, and over 70 in-house engineers, we are capable of handling any type of unique project or scope. Contact us here to learn more about our products, services, and technology, or call 866-922-4584 for direct assistance.